What is bikepacking? It is a way of traveling by bike that is perhaps more adventurous than using traditional panniers. It forces you to sacrifice extra baggage in favor of excitement. Less cargo and more fun. Bikepacking first emerged in the United States and Canada through the self-sufficiency races that are held in those countries. The vast areas result in long distances that must sometimes be covered as part of a single stage. The lack of assistance and support means that riders must carry the necessary items for bike repairs, sudden temperature changes, rain, nightfall and even cooking. The bikes should also be able to handle everything from gravel or paved paths to narrow, winding trails. This would be impossible with rear racks and panniers in a race against time to the finish line. One of the virtues of bikepacking is the bike’s solid handling. Complicated terrain does not get in the way of epic trips or rides, which means you can explore even the most remote corners. What are the basic elements of bikepacking bags? They are attached to the bike using velcros and straps. There is no need for secondary mounts, such as metal racks. The bike serves as the mount for everything. Under the seat or on the frame, inside the main triangle as well as above or below the tubes. On the handlebar and even on the fork. One of the biggest advantages of this is that a specific type of bike and a rear rack are not needed. In summary, just about any bicycle is suitable for bikepacking. Additionally, this type of bag layout always keeps the weight over the bike’s vertical axis as opposed to the horizontal one. This makes the bicycle much more agile and easier to handle. 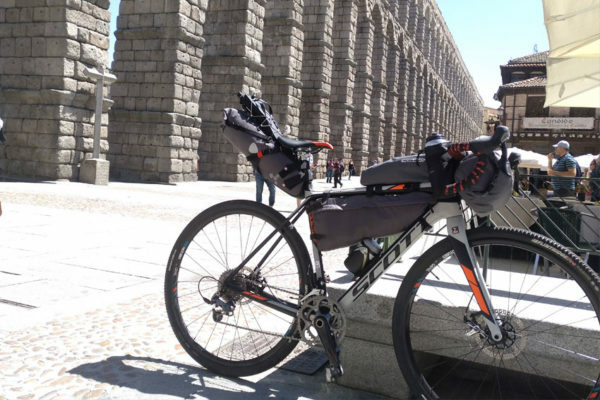 These are probably the two biggest differences compared with bike touring using panniers. Beyond this, there are other recommended features that manufacturers can choose whether or not to implement. It is important for our bags to be 100% waterproof, for the mounting systems and seals to be reliable, and for the shape to fit snug against the bike. Bikepacking is the bike touring alternative for more adventurous cyclists. For riders who don’t want to take a detour around that fun stretch of trail simply because of the load they are carrying. For people who like to travel with just the bare essentials or go on night rides or spend an entire weekend on two wheels. Carrying all the basics but leaving behind the unnecessary extras. Bikepacking is an approach to life and a way of escaping our daily obligations; it is a friendly rebellion that many people are in search of. For all these reasons, bikepacking is gaining followers on a daily basis.